René Redzepi, Alain Passard, Mauro Colagreco…this may appear to be a shortlist of world’s most exciting chefs, but their names also comprise a checklist of those who have recently made their way across the world, from Europe to little Los Gatos, to cook at one specific restaurant – David Kinch’s Manresa. Kinch first hit the national headlines in the summer of 2004, when at the behest of Eric Ripert, he prepared a meal at Le Bernadin for a group of journalists. Ripert had just eaten at the chef’s then newly-opened restaurant and was amazed: ‘that guy is seriously talented. I was like, Son of a *****! He has an incredible, obsessive knowledge of his products and the rare talent to elevate ingredients to their best.’ The assembled guests were stunned and delighted by what he had cooked with the local produce that he had brought with him all the way from the Bay Area. Since then, inspired by Passard’s biodynamic gardens, Kinch has followed in his footsteps, establishing a partnership with farmer Cynthia Sandberg to create their own potager to produce Manresa’s produce. This search for superior ingredients, in combination with his creativity and talent as a chef, has won him loyal and growing admiration locally and globally. In 2007, he was invited to speak at Pamplona’s I Congresso ‘Vive las Verduras’ and then at the Festival International de la Gastronomie de Mougins the year after. He is currently recognised as a chef on the forefront of gastronomy. Born in Pennsylvania, David Kinch’s first foodie memories are of his grandmother – ‘my big German grandmother’ – who would regularly cook, for tens of guests at a time, her traditional Teutonic recipes. However his family’s business being oil, he had to move around when young, before finally settling in New Orleans. At just fifteen, whilst at high school, he began bussing tables at Commander’s Palace where he became ‘mesmerised by the chefs. They were like pirates – treating people insolently and working over open flames…they had a free spirit, they were creative – I found myself drawn more and more to the kitchen.’ And that is where he moved to, making salads under local legend Paul Prudhomme; ‘from the first day, I knew I loved it and I didn’t ever want to leave it.’ Although it was not until a couple of years later when one of his best friends, a trumpet prodigy playing in the city’s philharmonic at fourteen, set off touring the entire country, that his eyes were opened to his own opportunities and he enrolled at Johnson & Wales Culinary Academy in Providence. Every summer, when the Giraffe closed for a month he would head to Spain. Not yet the home of all things molecular, he fell in love with the place, even running with the bulls in Pamplona for five years straight. His yearning for learning though led him instead to Japan where in 1989 he acted as consultant chef to Hotel Clio Court, Fukuoka. A year on and he had moved to Silks at the Mandarin Oriental in San Francisco. This was prior to a two-year tour of Europe that entailed stages at Schweizer Stuben (2*) in Wertheim, Germany; then l’Espérance (3*) in St. Père-sous-Vézeley under Marc Meneau; a summer doing cellar work in a small domaine in Sancerre; and finally and most influentially, six months at Akelare (2*) in San Sebastian. 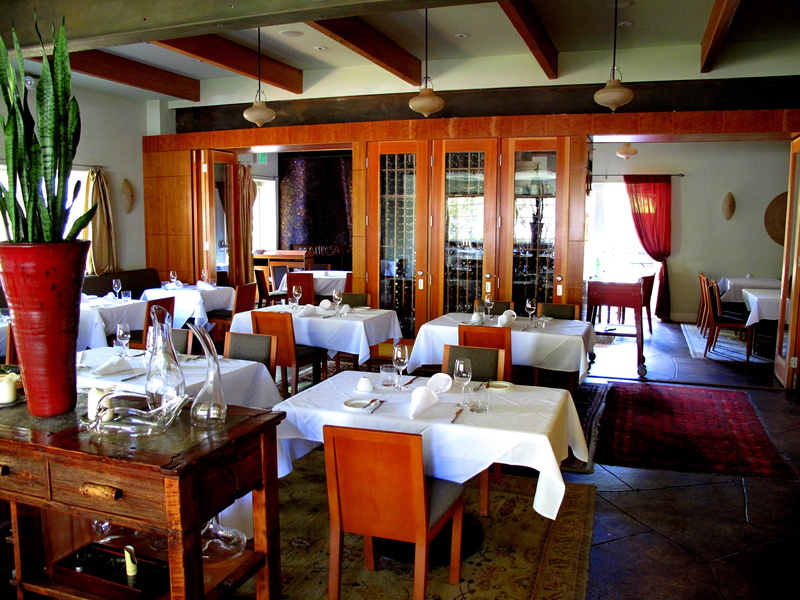 In 1993, Kinch returned to San Francisco as executive chef of Ernie’s, a local landmark, but two years later left to start his own venture, Sent Sovi in Saratoga, which opened the day after Bastille Day, 1995 – ‘a neighbourhood restaurant that’s overachieving. That’s our model.’ Soon his cooking was attracting attention, but he felt confined by the size of restaurant and especially its kitchen with only a single oven and two electric broilers. He needed more space. 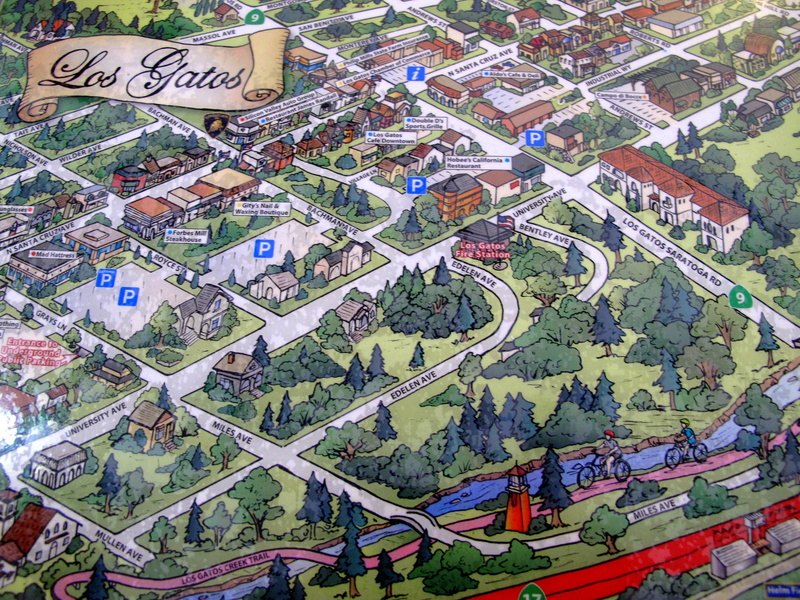 After much searching around the Bay Area, Kinch found what he was looking for just seven miles away in small, sleepy Los Gatos, a town in the Santa Clara hills sustained by the riches of nearby Silicon Valley. 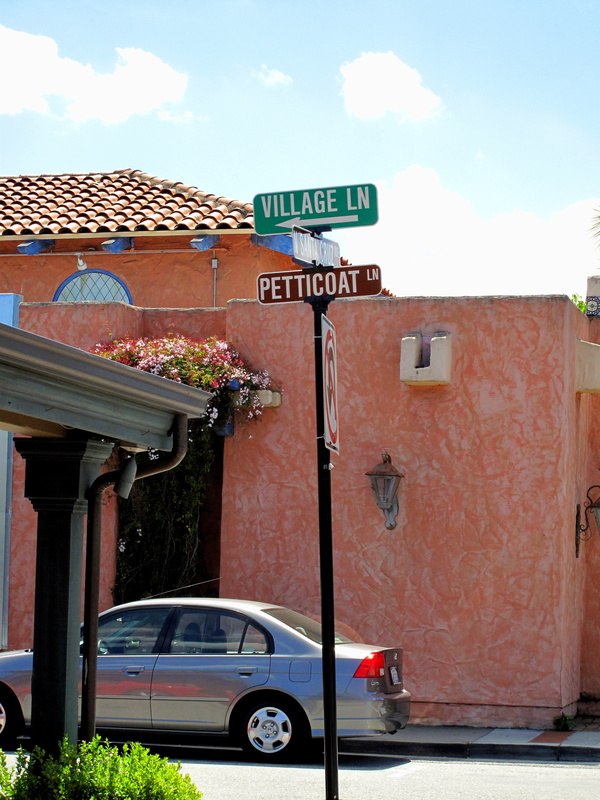 On a downtown side street, he bought a 1940s single story ranch-house once known as the Village House, formerly a tearoom, but by then long-empty, and hired architect Jim Zack and kitchen-designer Mark Stech-Novak (Keller, Ducasse, Vongerichten) to renovate and modernise it. Wine later said that Kinch had ‘worked and walked his way around the world in order to prepare himself for the ideal kitchen.’ That ideal kitchen was a custom-built, seven-hundred-and-fifty foot-squared laboratory (almost double his previous space). Pride of place went to a two-and-a-half tonne bespoke Bonnet Cidelcem Maestro stove from France; it was so big it had to be installed before the surrounding walls could be completed. 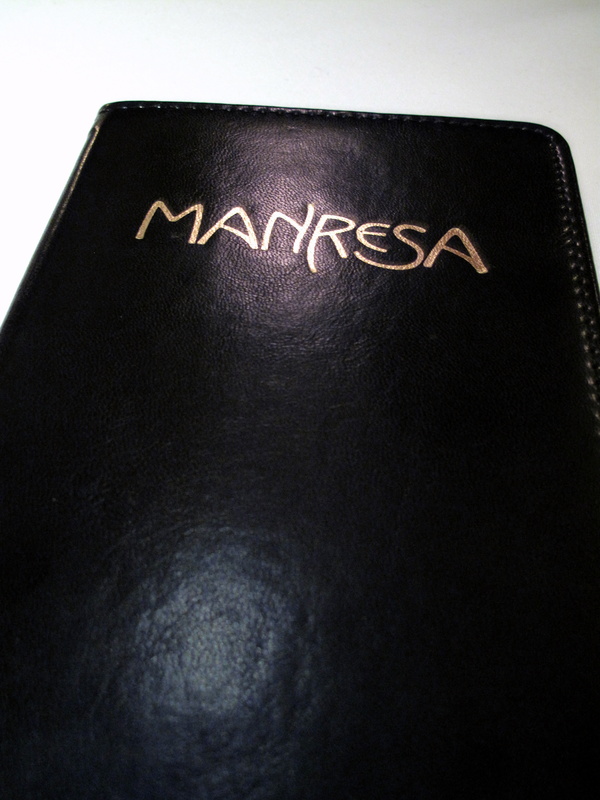 He christened the restaurant, Manresa. It opened on Bastille Day, 2002. 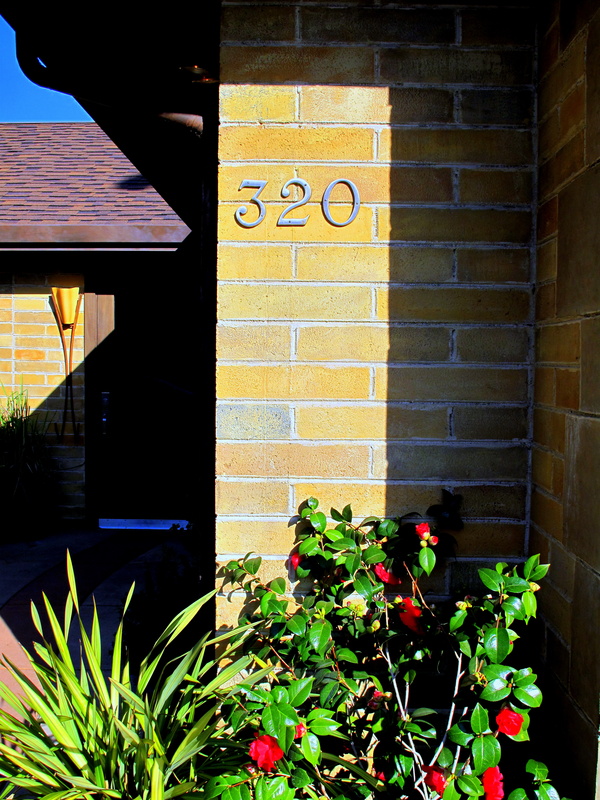 There are a couple of reasons why the Santa Clara Valley appealed to Kinch. One is the beaches. Indeed even if these are irrespective of cooking, they allow the chef to enjoy daily his (perhaps first) love, surfing – something which he discovered in his ‘skateboard and surf punk days’ on the Gulf Coast. ‘I’m a surfer. I wanted a more integrated life,’ he has said. In fact, it is from one of these beaches, just south of his home that the name of the restaurant stems from, itself so named by the early Jesuit immigrants to California from the same-named Catalan town where the founder of their order, St. Ignatius of Loyola, took refuge in a cave. Coincidentally, Sent Sovi was Catalan too, its title taken from an old cookery book – Libre de Sent Sovi – (maybe) meaning ‘sweet taste’ and celebrated throughout the courts of Europe in the fourteenth century. Kinch believes that ‘there are two characteristics that enable restaurants to transcend the ordinary. First is that someone has a vision…the other is a sense of place – the restaurant couldn’t be anywhere else than where it is.’ He wanted the cooking to reflect who and where he was and to, like Chapel had, ‘create a sense of place’. Thus, sandwiched between the mountains and the ocean (thus bringing to mind the Basque country) and amid some of the richest farmland in the United States, he quickly fell in love with the area’s unique and fruitful terroir. Whilst in Saratoga, the chef had his own herb garden and employed a forager on nearly full-time basis, but after the move to Manresa, he expanded his local supply lines: he buys from (and surfs with) the producers at the much-loved Dirty Girl Farm; sources his cherries, apricots, peaches and nectarines from the nearby Novakovich family; and knows well the retired IBM software developer, Gene Lester, who owns twelve acres filled with hundreds of rare and exotic citrus to which he lets friends help themselves. Each of these suppliers is important yet secondary. 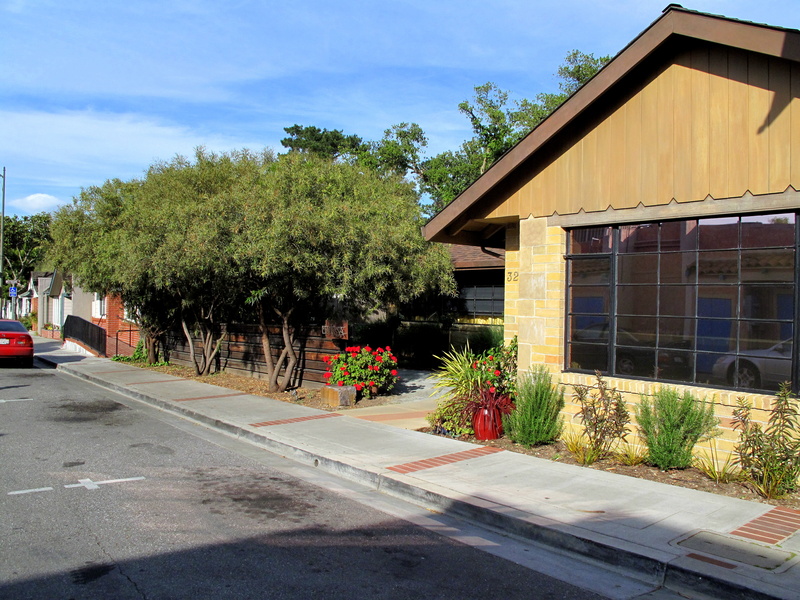 It is actually a two-acre plot in Ben Lomond, twenty-five miles from Manresa, which shares a mutually-dependent and mutually-rewarding relationship with the restaurant. It is called Love Apple Farm and run together with attorney-turned-farmer, Cynthia Sandberg. Several years ago, it dawned on Kinch that local chefs were ‘go[ing] to the farmers’ market and all…buying the same organic leeks and lettuces. We’re all doing the same thing. I wanted to do better.’ To him, the natural next step was growing his own. Originally, he thought about buying a farm, but after tasting some of Sandberg’s organic tomatoes, he asked her to supply him exclusively. When it came to negotiations, each had a final condition, which fortuitously turned out to be the same thing – to try biodynamics. By November 2005, the pair had made their first ‘preparation’ of manure-stuffed cow horns to be buried beneath the soil. 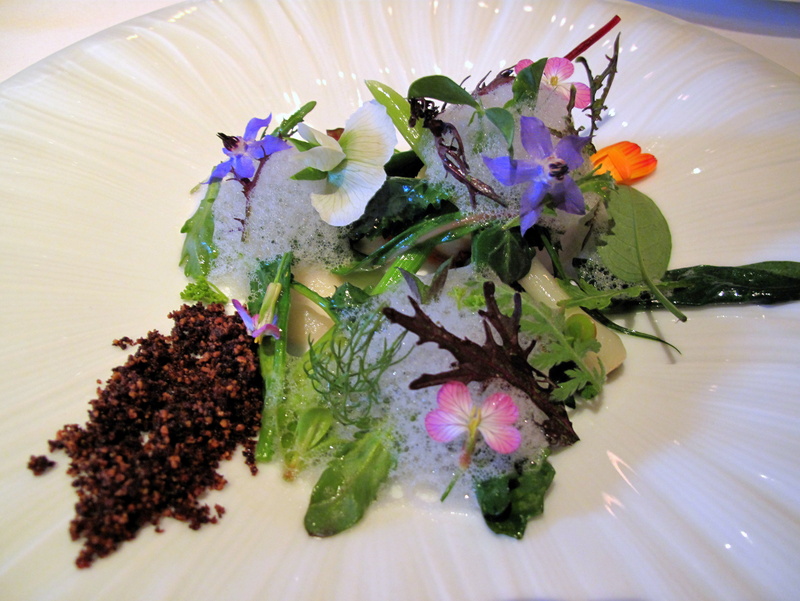 By summer 2006, the garden’s crop was on the restaurant’s menu. David Kinch is a chef’s chef. ‘I do it because I still like to. I don’t want to work in hotels. I don’t want three restaurants. I don’t want to do five-hundred covers a night…None of this interests me. Call me anti-success…but I just want to cook in my restaurant with my crew in my beautiful kitchen and make people happy.’ His collection of 1200 menus, partly hung upon Manresa’s (bathroom) walls, is evidence that he himself is a lover of good food and in his spare time, reads French, Spanish and English cookbooks and travels around the world to learn and try new techniques. His time out of the kitchen however is limited by his desire to be at the pass for every service. The first time he left the restaurant for more than two nights in a row, to visit France, ‘he was constantly on the phone, checking in.’ Behind the stove, he has a reputation as a serious, intense perfectionist and showed these colours last March when battling against Bobby Flay in America’s Iron Chef competition. For the contest’s ‘secret ingredient’ round, he had readied himself meticulously – ‘I didn’t go in blind. I tried to narrow it down so when the ingredient was revealed we had a line of attack’. He had in fact prepared fifteen lines of attack. The mystery item was cabbage. He won. Two weeks later, Aaron and I arrived at Kinch’s lemony-mustard yellow rambler. Set within a small garden and nicely nestled in lush native fauna, it is not easy to recognise the building as a restaurant. 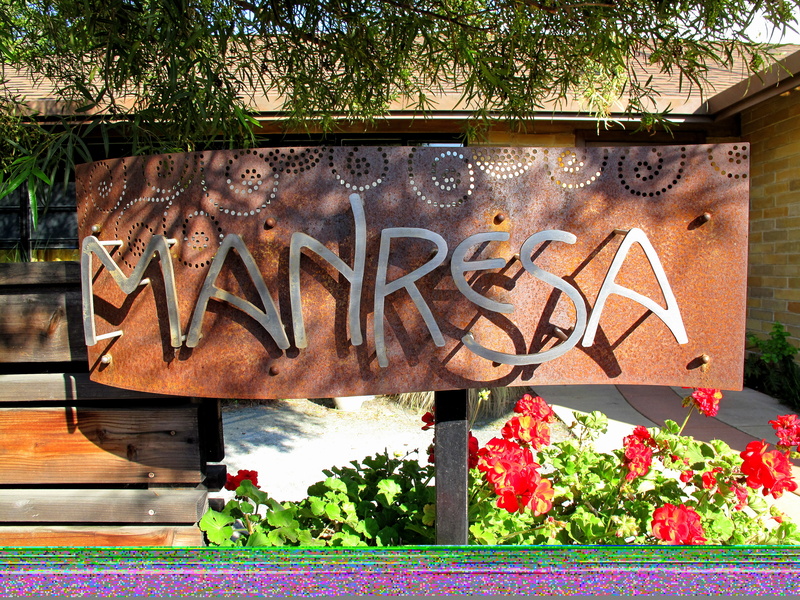 There is a madest, wavy sign of rusted metal buried in a bed of red flowers that spells Manresa in funky type, but even this is nearly hidden by citrus trees lining the fence in front. A thin tiled column of red carpets the path to the large, reflective front door. Once within, a corridor leads to the dining area; there is a rippled glass window on the right through which one can spy the chefs in the kitchen, dressed in white and sleeves rolled up, surrounding the stainless steel stove that boasts four ovens, a continuous flat cooking surface and two salamanders. Inside, the theme is rustic Hispanic and accentuated with its warm, characteristic tones of yellow, brown and red, the classic colour of the Iberian kitchen. The dining area, seating nearly seventy, is bound by slate-grey smooth stucco walls and a cracked cement floor that has been fashioned to resemble natural tiles. The ceiling is composed of wooden beams supported by a single steel bar. Tables are nicely spaced with two to each of the Colonial Spanish rugs that litter the ground in an assortment of miss-matched shades. It is spacious and bright with windows stretching wall-to-wall; lighting is from bulb-like hanging lanterns. The room is separated into two by a varnished oak partition that doubles as a wine cabinet. The larger, principal space is occupied by four central tables with several more lining the low-lying grey banquettes that border on two sides. They are dressed in thick white linen and are set with crystal stemware, Villeroy & Boch crockery and miniature enamel beehive candleholders. In the middle, there is a free-standing, sturdy chest laid with ornamental glass flasks, corn potpourri and large red ceramic vase filled with seasonal bouquet – Sansevieria Black Coral today. Upon the walls, crushed silk curtains are coloured gold and various vibrant, geometric art pieces hang. A curved, creamy border behind the entrance conceals the bar and kitchen. 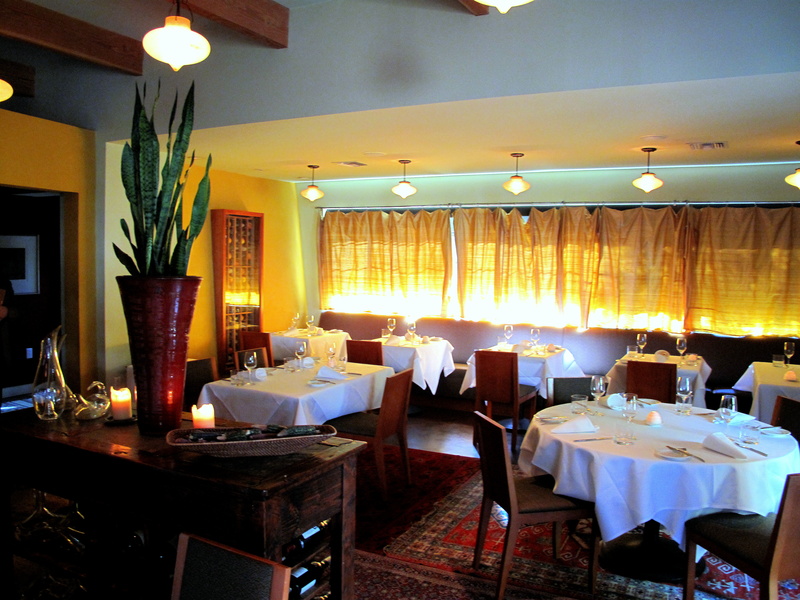 The second room, which can be used for private functions, is narrow and long. Large patio doors, fringed with sangria shantung drapes, open onto the garden behind. The showpiece is a corner fireplace, covered in tiny mosaic tiles of sapphire blue hemmed with hues of olive green and comprising a mantle bearing the restaurant’s name and fire-pit filled with candles. 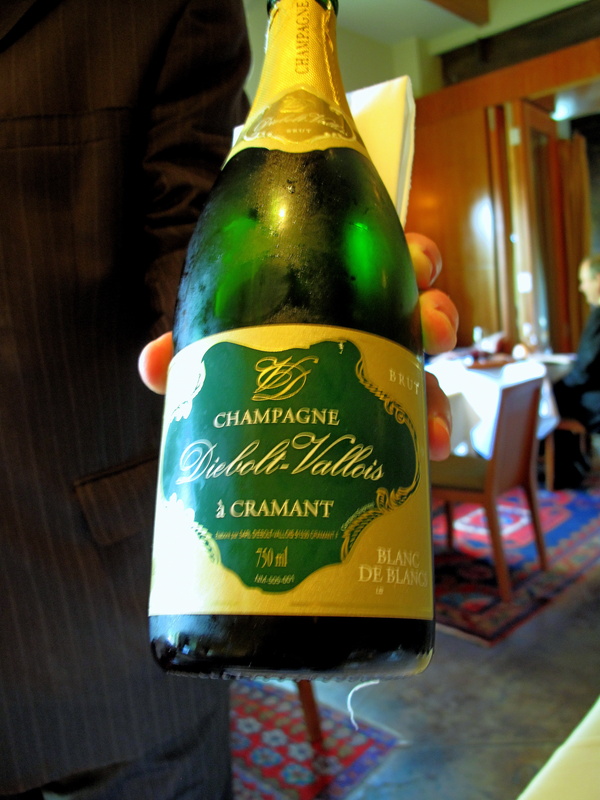 Aperitif: Champagne Diebolt-Vallois à Cramant, 1996. This lingering yet light blanc de blancs, with its distinctly delicate, faintly fruity scent of chardonnay, was an unintended nod to the spring season. 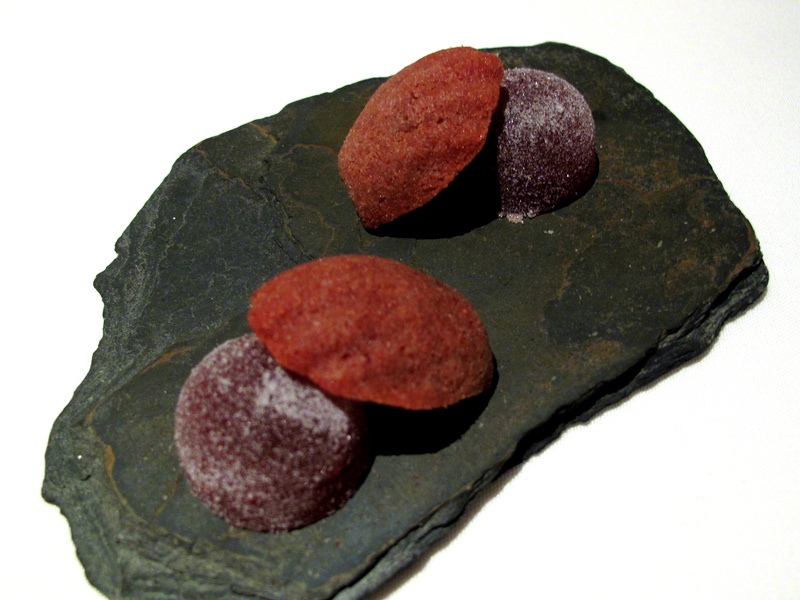 Amuse Bouche 1: Petit fours “red pepper-black olive”. 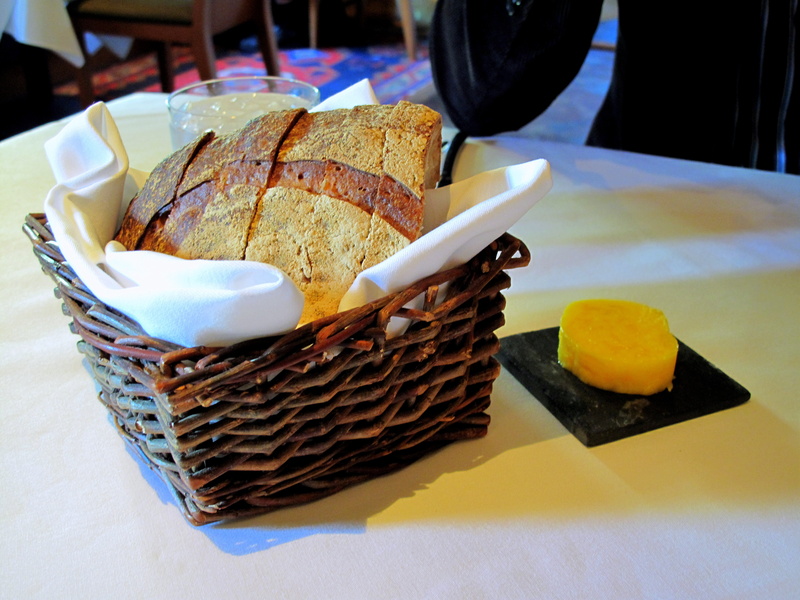 Manresa’s signature amuses bouche – black olive madeleine and red pepper paté de fruit – were served on a thick, rustic rough slate slab. The former, memorably and forever famous for its semblance to ‘la valve rainurée d’une coquille de Saint-Jacques’, is also with the sugar-dusted jelly, a compliment to Pedro Subijana, who has a similar habit of offering savouries disguised as sweets – polvorons of artichoke; black pudding that resembles a cinnamon swirl; even his own ‘madeleines’ that are actually cocoa-encrusted oysters – before the meal. It is an amusing play on accepted customs, concurrently comforting those uninitiated to finer dining, whilst also light heartedly teasing those who are. The small cake was warm and biscuity with the subtle sweetness of olive and consistency of cookie dough whilst the red pepper had latent vegetal sweet heat, tasting strongly of roasted capsicum, with a gummy, but not sticky, denseness. 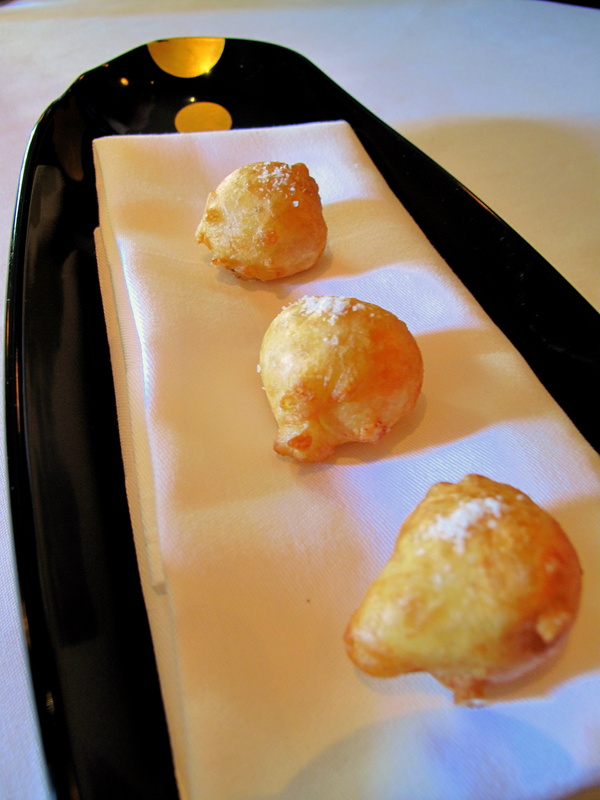 Amuse Bouche 2: Garden beignets, vinegar powder. 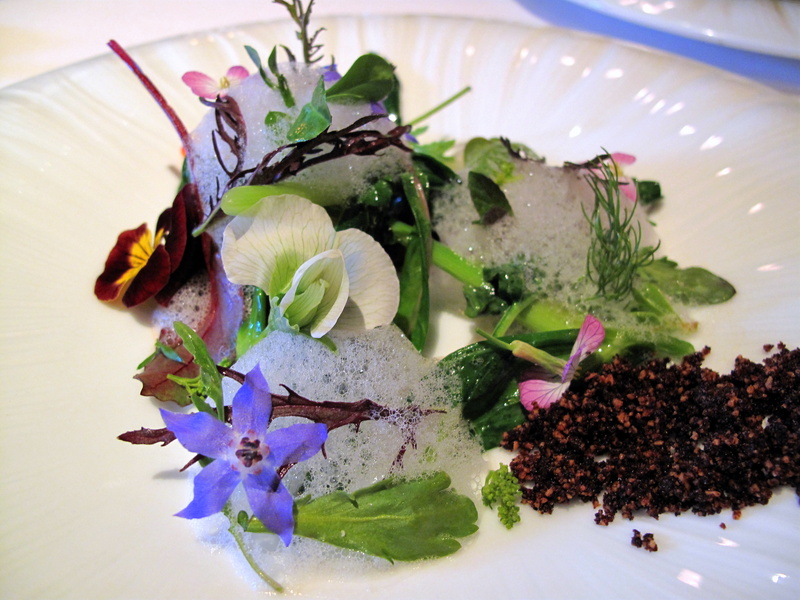 Two beignets of purple and green mizuna were sprinkled with a little vinegar powder. The well-fried, greaseless samples were fluffy and soft with a leafy crunch and mild peppery piquancy; the vinegar atop added salty tanginess. Amuse Bouche 3: Mustard granité with carrot. 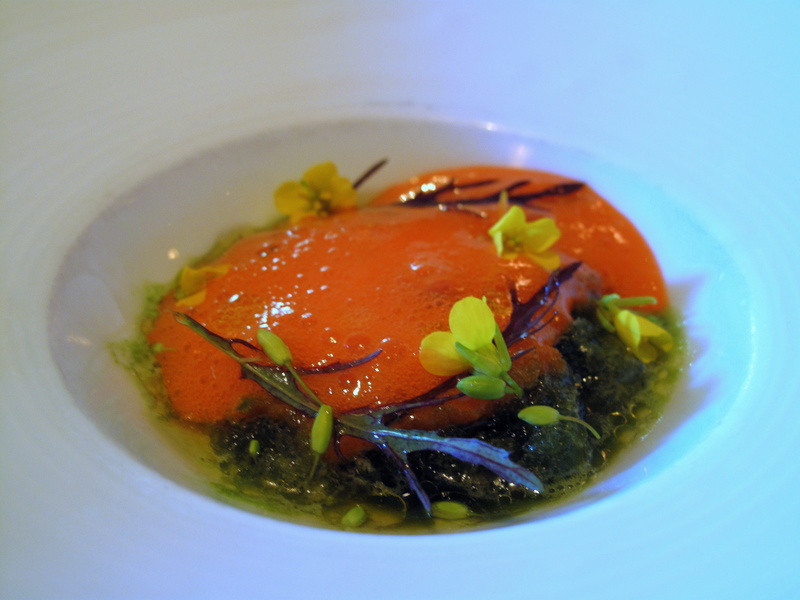 A bright blanket of carrot foam covered granité of mustard interspersed with red leaf mustard flowers and leaves. The sweet carrot was nicely contrasted by the icy condiment whose own warmth of flavour coupled with its confusingly cold temperature toyed with one’s expectations. The tender greens added excellent texture and amplified the pungency already present. 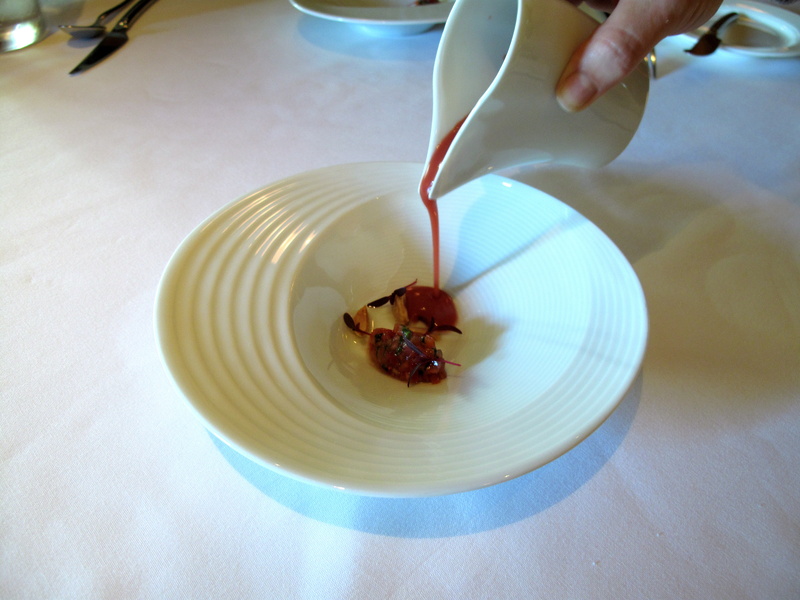 Amuse Bouche 5: Strawberry gazpacho, almond oil. 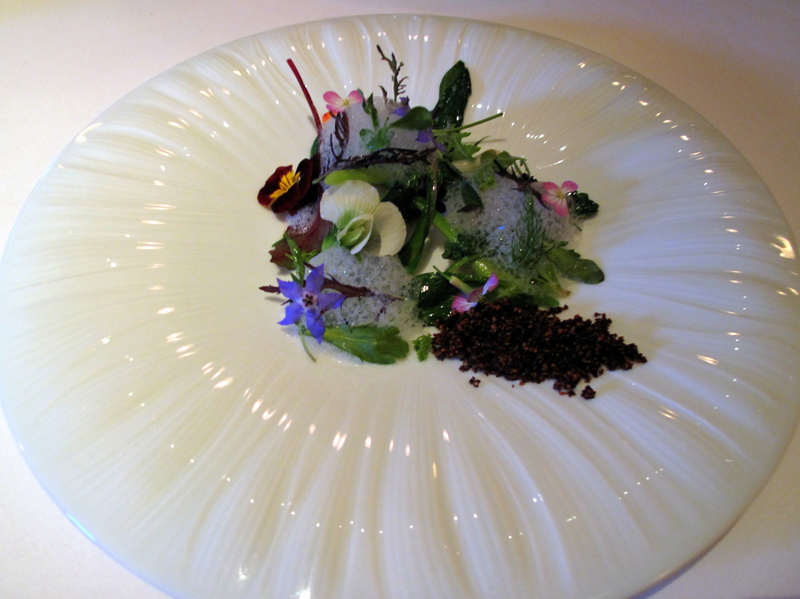 A brunoise of onion, garlic, cucumber, capsicum, tarragon and strawberry sat in a bowl with amaranth shoots and Marcona almond halves; at the table, a consommé of the same components, along with almond oil and chive, was poured in. The mind games had recommenced with what seemed on sight a stereotypical gazpacho of tomato, but smelled and tasted of summer berry; Kinch, believing in the innate analogy betwixt the two, abandoned the former (often mistaken as the fundamental ingredient for this Andalucian soup), in favour of fresh strawberry. It was the deft accord between the fruit and alliums that stood out here; the savours were each clear and precise yet in total harmony. The cucumber, pepper and onion offered succulent crispness; tarragon and amaranth, a little sweetness; whilst Marcona almonds added Spanish crunch and the oil, subtle toasted nuttiness. 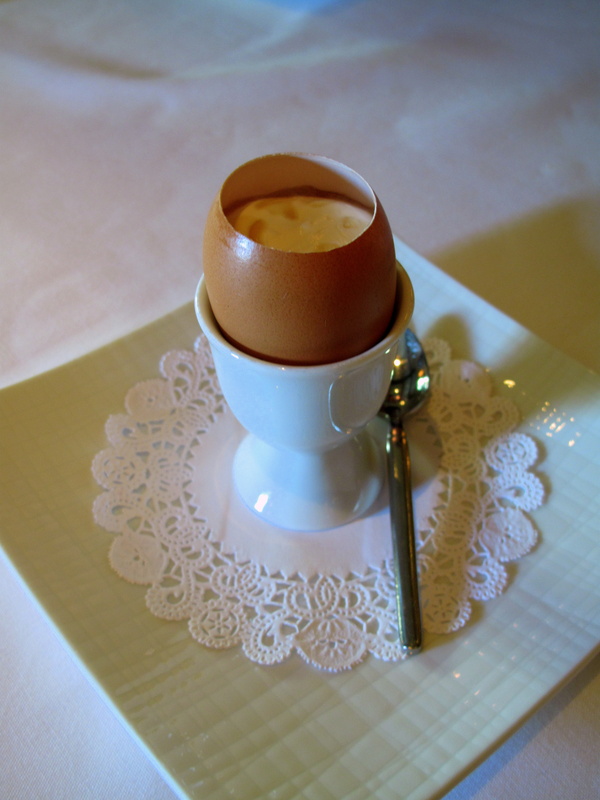 Amuse Bouche 6: Arpège farm egg. Controversially inspired by Alain Passard’s trademark amuse, oeuf à la coque; quatre épices, a carefully decollated egg, from Manresa’s own farm, was warmed in a water bath, but the yolk not allowed the set. On removal, it was sprinkled with chives, filled with crème fraîche and spiked with Tahitian vanilla and sherry vinegar before being topped off with fleur de sel and some maple syrup. The first smoky-sweet taste was of this, but it was quickly countered by the subtly tart cream beneath. Delving deeper down and wounding the yolk, the vivid yellow that bled out was brilliantly rich and tasty. However, although the chives helped a little, a little more vinegar would have helped better to cut through the heavy yolk and compete with the sweeter vanilla. A comparison between this and the original is inevitable: from my experience, the actual egg at Manresa is of far superior quality, but l’Arpège’s oeuf has a finer balance. Le Pain: Pain au levain, Pim’s butter. This single choice of sourdough proved the old adage, ‘quality over quantity’. Thick with faintly tangy crust and fluffy, soft open crumb, the excellent homemade bread was accompanied with excellent homemade butter. Made by Pim with the milk from a Normande cow she co-owns with the owners of Deep Roots Ranch in nearby Watsonville – for the record, Nutmeg is her name – the hand-churned vibrant beurre was smooth, complex and rather French in character. Entrée 1: Shellfish in crab broth, green strawberries. 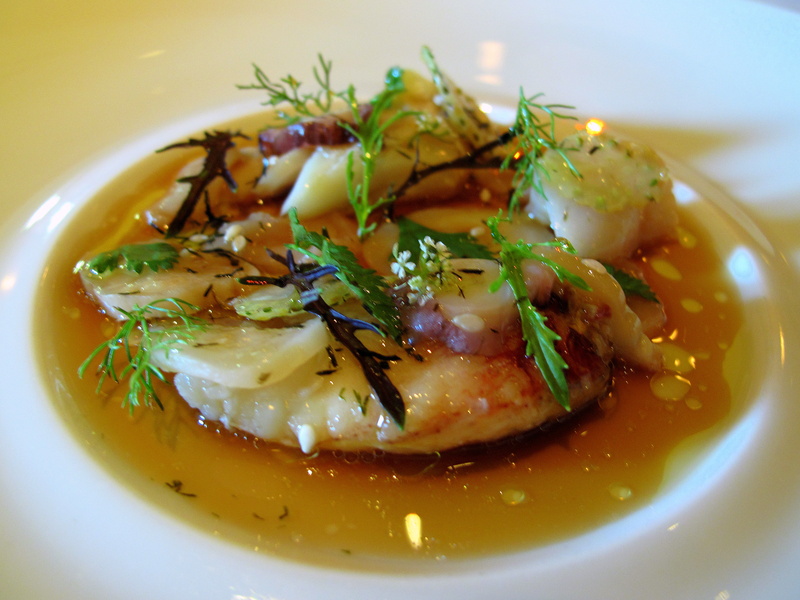 Two claws of Dungeness crab, one laid as the yang to the other’s ying, were layered with overlapping cross-sections of geoduck clam, octopus and green strawberries, all strewn over with coriander flowers, fennel fronds, red leaf mustard and chervil, in a shallow crab broth laced with extra virgin olive oil. Dungeness, a local speciality, was meaty, delicately sweet and salty while its stock, quite concentrated, though clean. The clam was firm yet yielding and octopus, very tender, disappearing on the tongue. Unripe strawberries from Dirty Girl Farm were a mildly bitter, barely acidic counterpoint to the sweetness of the shellfish, with which the fennel and chervil had natural affinity. Mustard and coriander delivered pepper and citrus. Entrée 2: Yuzu and sea salt snow with buckwheat honey, toasted seaweed with mackerel. 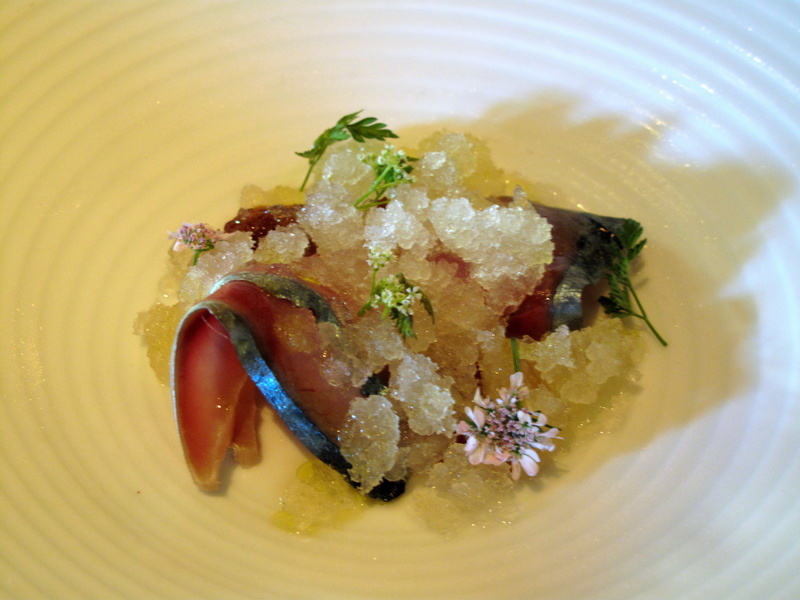 Twisted slivers of cured Japanese mackerel, their silver sapphire skin framing maroon flesh that depreciated to pink, resting on rosemary oil, were buried beneath yuzu, sea salt and buckwheat honey infused, icy crystals and chervil flowers. Marinated with tart sherry vinegar, the mackerel was intense, but deliciously tempered with the sour, salty-sweet, citrusy snow that beautifully balanced the oily richness of the fish. A further hint of lemony-mint was imparted by the aromatic oil. Entrée 3: Asparagus in bonito butter, toasted seeds. Blanched Julienne laces came entwined with skinny, raw ribbons of mandolined Sacramento Delta asparagus, sprinkled with furikake, in a bath of bonito butter. From the plate, an inviting perfume was immediately perceptible. An initial taste showed that the sweet, tender vegetable went very well with the salty, savoury sauce whose umami effect was enhanced by the nori, katsuobushi and toasted sesame seeds that the Japanese condiment atop was composed of; its seedy crunch was an additional benefit. The deep, beefy flavour of the frothy bonito lingered long on the tongue. Entrée 4: Mar y muntanya; vegetables with caviar. 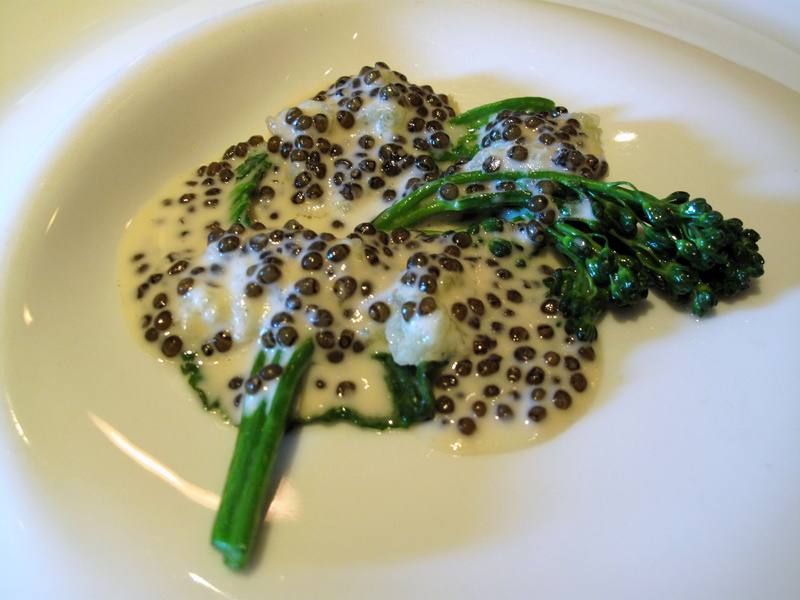 A crisp cabbage leaf, upon which were set stems of brocollini, was smeared over with fork-crushed kohlrabi and its sauce, densely dotted with Iranian Oscietra caviar. The aesthetic was arresting. Dark green rug and ridges, shrouded with paler paint punctuated with gleaming feldgrau beads mimicked, at once, both a mountain landscape (note the undulating aspect assumed by all the elements) and ocean scene (see the dynamic rhythm of the sauce and seaweed-esque vegetables). It also simultaneously had the semblance of something refined – luxurious caviar coupled with an exotic hybrid of broccoli and kai lan from faraway China – and something rustic – roots and puy lentil-like pearls. The savour was just as successful; the briny, silky subtle caviar, prepared malossol (slightly salted) married with the gentle sweetness and firmness of the greens; there was also a nutty note running through the long stems and roe. A small detail, easily missed, was that this was a clever play on crucifers, what with cabbage, brocollini and kohlrabi all belonging to the same family. Entrée 5: Into the vegetable garden…Scattered, deep periwinkle blue borage blossoms, pink-fringed radish flowers and colourful orange Crystanthemum ones caught the eye from a cluster of variegated vegetable roots, stems, shoots, seeds, buds and leaves that satisfied every shade of green across the spectrum; a trail of heaped crushed chicory and hazelnut suggested an appropriate starting point on the plate. Hand-picked just that morning, having made the short journey to the kitchen never even seeing the inside of a refrigerator, the produce was as fresh as possible. Indeed though no longer living, the last vestiges of life lingered in each legume and leaf – a romantic image maybe – but they had been assembled to inspire an idea of what first light at the farm that very morn must have been like: the greens, of course, represented the plants and the chicory-hazelnut signified the soil, but there was also a delightful and appreciated attention to detail with the intermingling, melting emulsion, made from the vegetables’ cooking juices and designed to act as that dawn’s dew. Eating was exploring. As one gathers food onto their fork, one must prod, separate, push away and uncover with their cutlery. The frothy mist fizzes and hisses as one digs into the dish, imitating the crackling of leaves one would hear as they walked around the garden. Each forkful is a new discovery: the first bite brings peppery baby rocket, succulent New Zealand spinach and sweet pea shoots together; the second, piquant glory frisee mustard, cooling spearmint and tart pansy flowers; a third… Then, beneath the foliage, there are larger elements hidden, like green onion and fingerling potato, as well as the bitter dirt and assorted purées of turnip and carrot that form the cohesive chords that bind every bite. 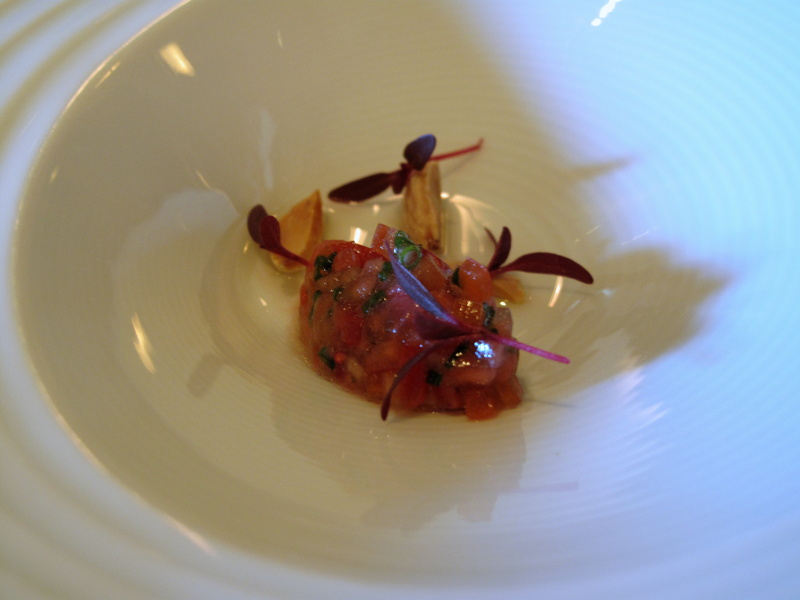 Entrée 6: Abalone in its own bouillon, seaweed persillade. Placed in the centre of a bright orange pool of its own broth, a whole Monterey Bay abalone, sautéed in beurre noisette, was glazed in wakame and sea lettuce persillade dressed with champagne vinegar. The rusty-coloured mollusc was, like the octopus before, juicy and yielding; Turks have a term for cooking such as this, ‘lokum gibi’. It had also absorbed the flavours of the salty-peppery topping that teamed nicely with the inherent honeyedness left behind by the brown butter, whilst the touch of subtly acidic champagne had an uplifting effect. 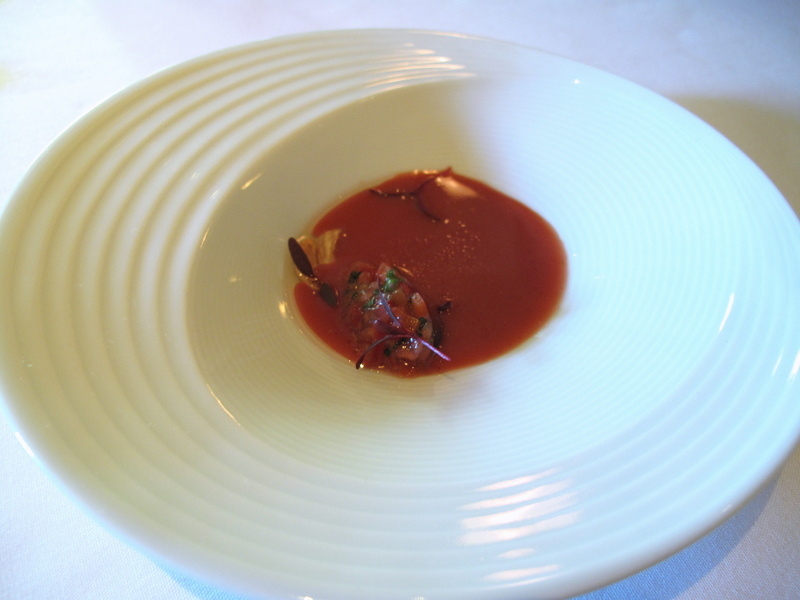 A small surprise came from the inclusion of a little xanthum gum in the rich bouillon, which gave it a viscidity that imitated the texture of the abalone in a very intriguing and eye-catching way. 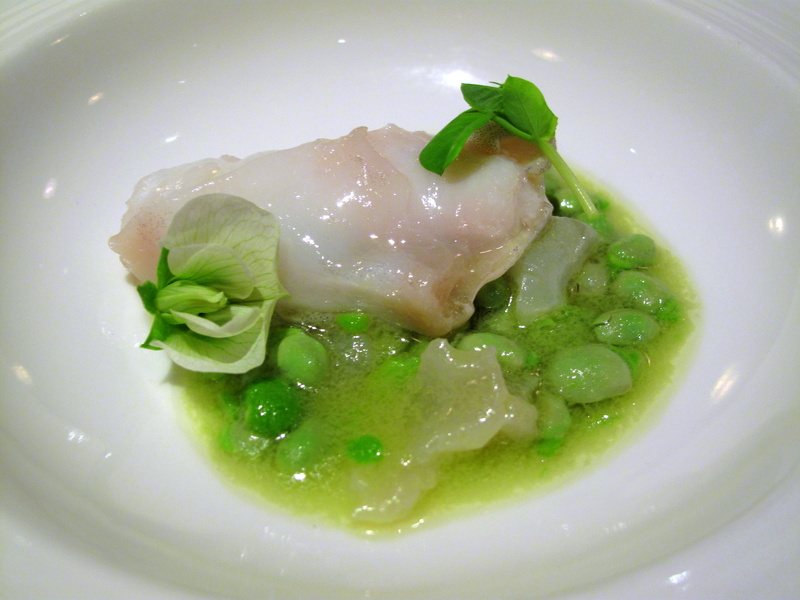 Entrée 7: Atlantic cod with fava beans, cod tripe. An Atlantic cod kokotxa was coupled with the cod’s tripe in an olive oil emulsion with fava beans, peas, their shoots and their flowers. A Basque speciality, kokotxas are actually the jowl of cod or hake and highly prized. And rightly so – they are delicate, gelatinous and utterly delicious. The equally unctuous tripa made this an even more decadent treat. The sweetness of the greens was a pleasing complement, whilst their crisp crunch, a very nice contrast. 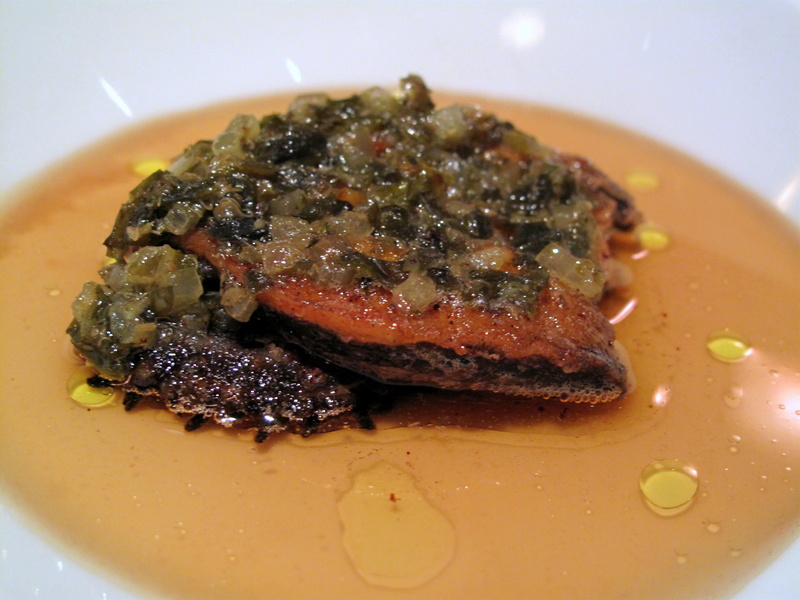 The intense sauce, thickened with the fat from the fish, had a lovely olive oil finish. Entrée 8: Vegetable risotto and spring peas, without rice… Peas and finely diced parsnip, Swede, turnip and kohlrabi, suffused with Arborio rice water, were accompanied by trumpet royale and trompette de la mort mushrooms, sautéed, fried and dried, in addition to fennel fronds and a mizzle of turnip milk foam. The root vegetables replicated the texture of rice rather well whilst some parmesan and the Arborio water supplied pleasing creaminess and a savoury relish that served as a counterpoint to their natural sweetness. The foam was a splash of sourness and the mushrooms varied the consistency, with the royales, meaty, plump and also nutty, standing out; this nuttiness also helped bring out similar savours in the vegetables and cheese. Plat Principal 1: Suckling kid goat, curds and whey. Mantled with an emulsion of bubbly alabaster goats’ whey, speckled with its curds, a braised cut of thigh from a baby goat lay buried. Along with their appetite, one’s humour and intellect are also fed here: the whey-curd coverlet concealed the contents beneath, thus building suspense and presenting the promise of something secret; its second purpose was to play its parts in the amusing faux-reformation of the kid – the white whey froth acting as its fluffy fur whilst the curds, the fat. The whey also worked to keep the meat moist while the slight salty-sourness of the soured milk mellowed the mild gaminess of the goat as it, through juxtaposition, also brought out its inherent, youthful sweetness. The young kid, raised locally by an English lady no less, at Harley Farms Goat Dairy in Pescadero, was so tender that each fleshy fibre separated strand by strand. Incorporating the goat’s flesh with its own milk was simple yet intuitive and clever. 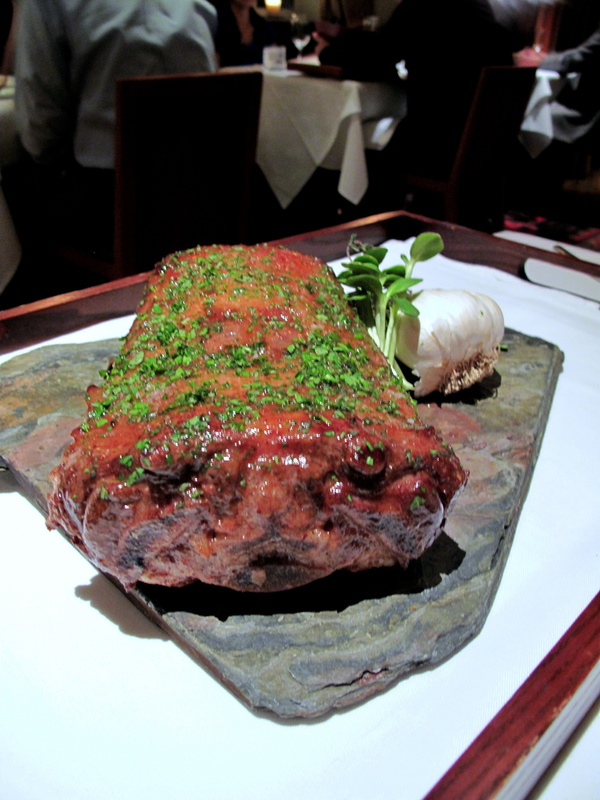 Whilst awaiting the next course, we were showed the slow-roasted saddle of lamb that would soon follow. Rich mahogany and glimmering, it was presented with a fresh, green patina of parsley, thyme and garlic that bore testament to the season. This premium cut, always apt on special occasions, was evidence of the kitchen’s butchery expertise. 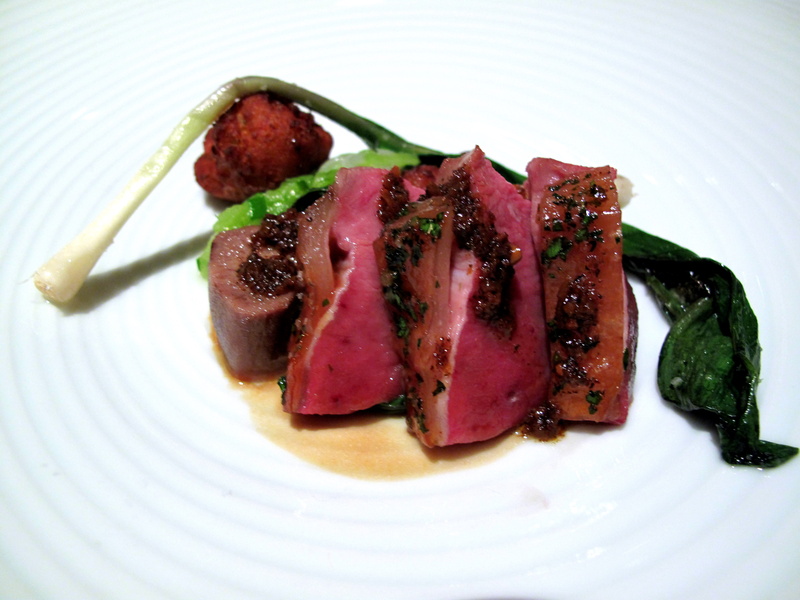 Plat Principal 2: Spring lamb, assorted spiced alliums, green garlic panisse. From platter to plate, Don Watson’s Napa valley spring lamb had been carved and served with a vibrant quenelle of assorted alliums, an intact ramp, pair of green garlic panisses and a confit slice of lamb tongue; ras el hanout garnished the ingredients. It was from this bespoke blend of unbeknown herbs and spices from the ‘top of the [chef’s] shop’ that an exotic, enticing aroma emanated. The milk-fed lamb’s cerise coloured flesh, thinly coated in almost amber adipose, was tender – no steak knife was needed – subtle and an excellent stage for the rich savours of the Moroccan mixture. The melange of ramp, leek and garlic was pleasantly creamy whilst the coarse and chubby chickpea-garlic fritters, having absorbed the meaty jus, were just scrumptious. This dish was superficially a fusion of Mediterranean cuisines, namely those of southern France and northern Africa. Provençal flavours – garlic, thyme, chickpeas, rosemary, lavender, leeks, lamb – abounded on the same plate as panisse, the predominant street food of Marseilles, the most prominent city of Provence. Ras el hanout, a Maghrebi concoction, was almost an aberration, but on second consideration, it may have been an inspired representation of the cosmopolitan melting pot that this same city is. Marseilles was the main port that linked France to her Muslim colonies and so now harbours a large number of immigrants from these lands, who have undoubtedly brought with them their own cooking cultures, which over time would have melded with the native one to possibly create recipes very much like this. Dessert 1: Exotic citrus with honey and spices. 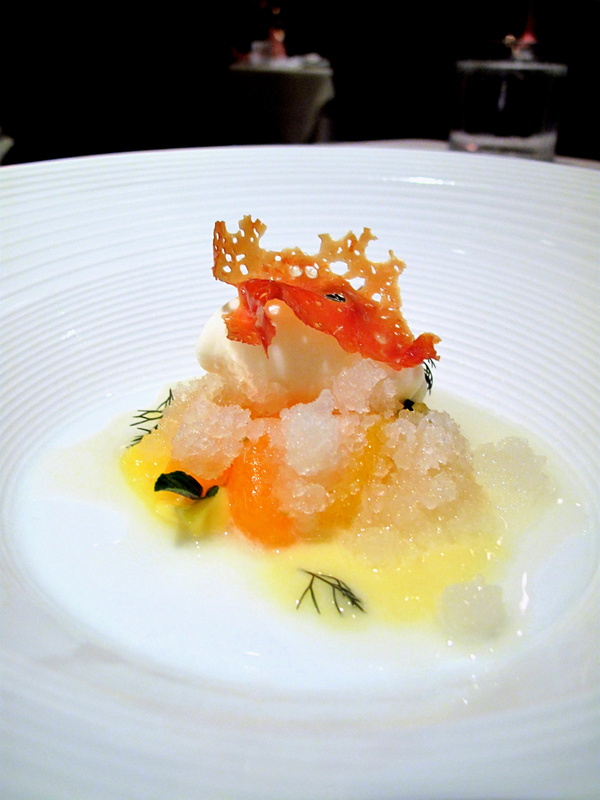 A covey of various citric supremes, all sauced in fennel frond-infused Meyer lemon rind purée and atop Corsican lemon curd, was covered in granité of oroblanco pomelo beneath spearmint ice cream and a crown of orange tuile. The underlying set of segments, supplied by Gene Lester, from his collection of exotic and unusual citrus in Watsonville, and which included rare breeds like temple tangor (tangerine-orange hybrid) and wikiwatangelo (tangerine-pomelo and grapefruit), were especially juicy with a tart-sweetness that was amplified by the acidic, sticky lemons and sweet pomelo ice. The ice cream was fresh and cooling, whilst the tasty tuile added crunch. Dessert 2: Do you know what it means to miss New Orleans? 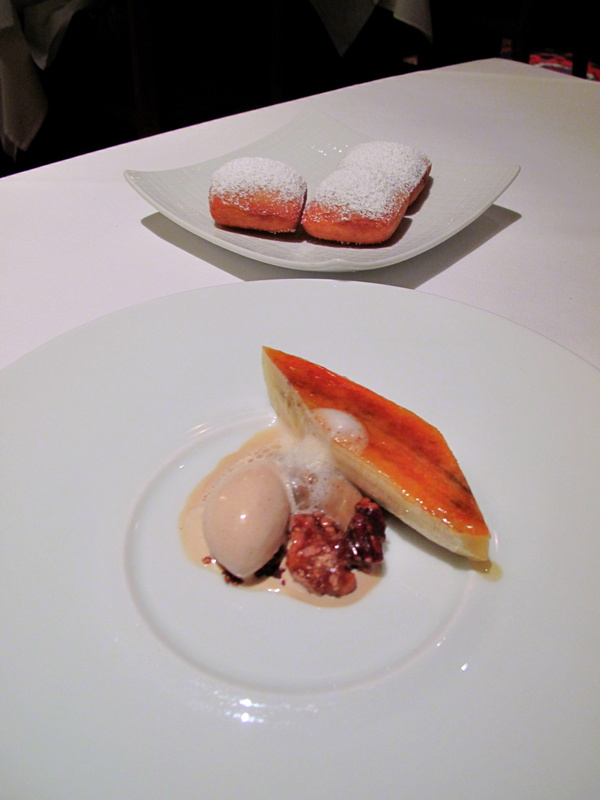 Bisected banana, its sliced-open crust caramelised, came with espresso reduction, pralines, their ice cream, chicory cream and milk coffee foam; alongside arrived powdered beignets. This dessert, bringing new meaning to the term home sweet home, was a curtsy from the chef to the Big Easy and possibly more precisely Café au Monde, the coffee shop that sits within the city’s French quarter and is celebrated for its café au lait and beignets. In addition to these though, the other flavours for which New Orleans is famous were also here: the banana (referencing bananas Foster) was rather firm, too firm, with a hard, brittle top; the pralines, the recipe for which was brought to the area by Acadian settlers ousted from Canada, whom replaced traditional almond for local pecan, were nutty-sweet and crunchy; and the mildly bitter and sharpish chicory, which, blended with coffee, is a Cajun custom. The beignets (the official doughnut of said state) were hot, sugary and airy, dissolving on the lips into a paste; we begged demanded politely asked for more. Petit Fours: “Strawberry-chocolate”. 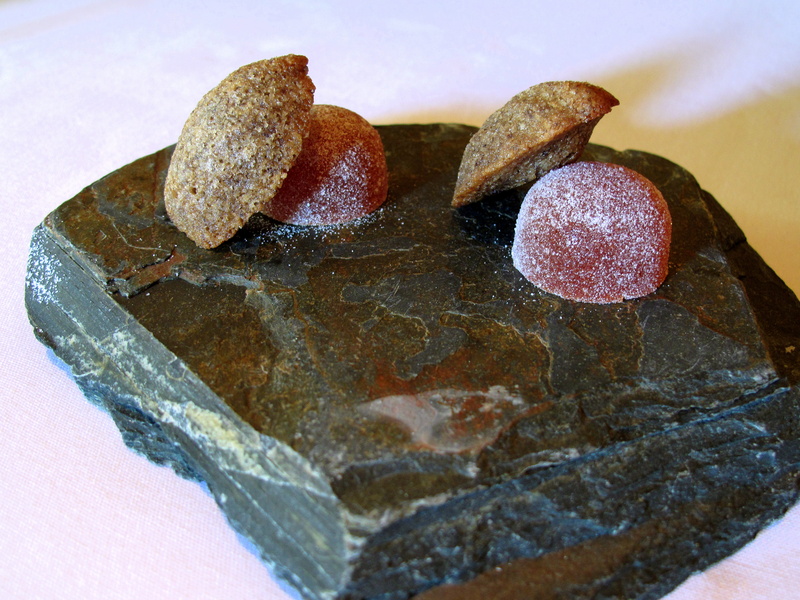 Manresa’s signature petit fours – chocolate madeleine and strawberry paté de fruit – were served on a thick, rustic rough slate slab. A reminiscence of the meal’s commencement, these little treats of thick, warm madeleine with excellent crispy edge and nicely-flavoured, smooth jelly, informs the diner that dinner is about to end in the sweetest way possible. 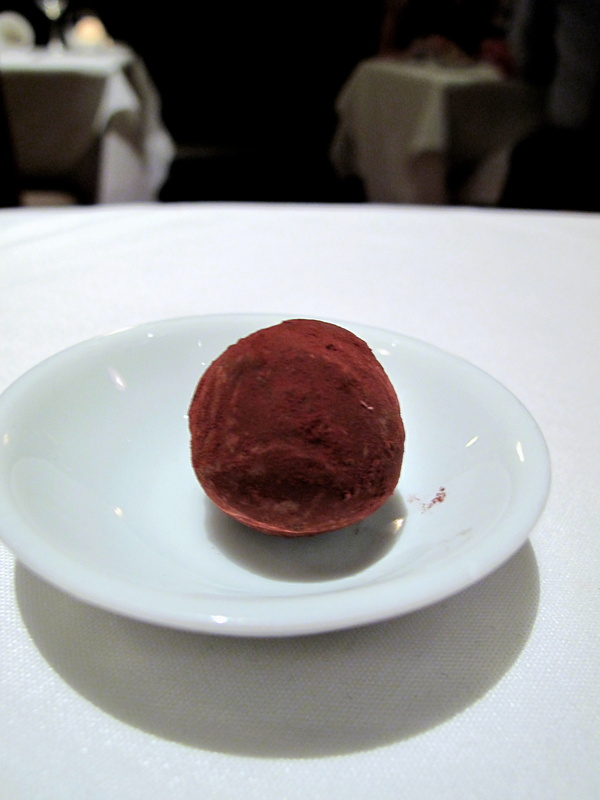 Migniardises 1: Armagnac and tobacco truffle. 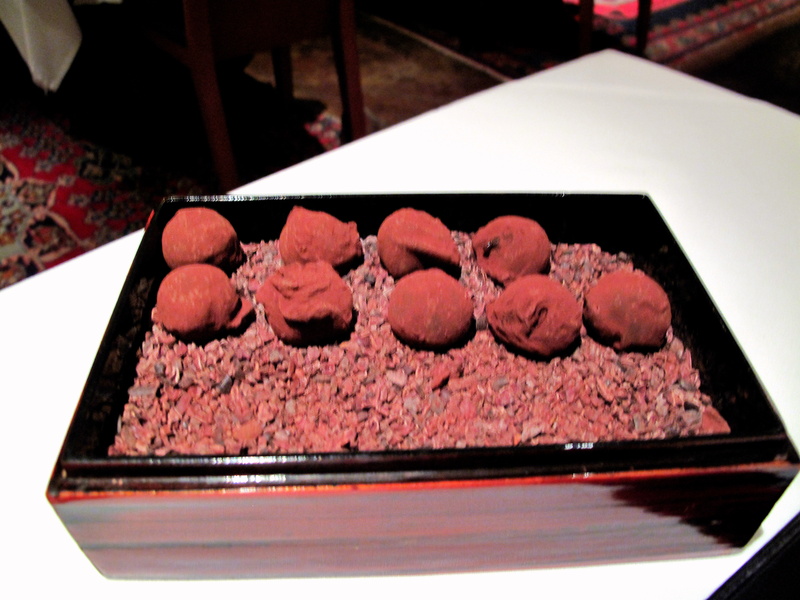 Before one leaves, they are offered homemade chocolate truffles of Armagnac and tobacco. Thin, crisp coats encased a thick liquid core. From within, the imbued brandy makes itself known straightaway, coming through strongly, but it fades and leaves behind a tingly spiciness from the tobacco. Migniardises 2: Salted butter caramels. 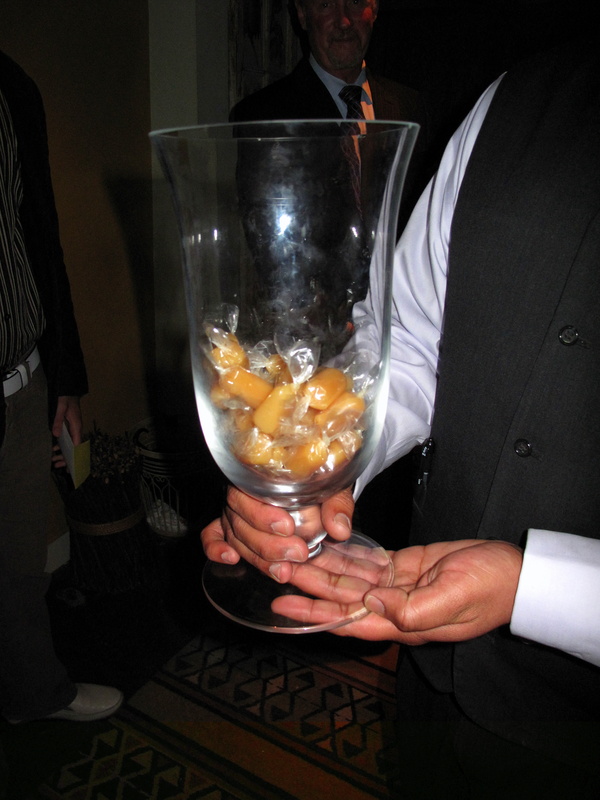 As a final souvenir, salty caramels were doled out at the door from a large glass urn. Slowly melting in the mouth, thick yet not heavy or sticky, they were perfectly balanced in savour and perhaps the best caramels I have ever eaten. Service was superb. Throughout dinner – and we were the first to arrive and last to leave – all the staff were welcoming, hospitable and attentive. Led by Michael Kean, general manager, and Esteban Garibay, maître d’hôtel, everyone was diligent, efficient and well-choreographed – maybe not surprisingly so given the years of experience they each have and Michael’s previous life as a professional dancer. Both were friendly and endearing, engaging us with conversation, but also taking the time to visit our table and ask our thoughts. Our serveur, Bryan, was particularly impressive, showing great patience, good humour and meticulous knowledge of the dishes. There was also tremendous generosity in both spirit and practise, which sincerely made dinner more of a celebration than simply a meal. The restaurant had an excellent atmosphere. Everyone wore a smile with people clearly in a good mood and very relaxed – guests at an adjacent table even started a dialogue with us. On a warm night, with good cooking and good company, in a pretty villa on the other side of the world, it was all rather convincing and very charming. 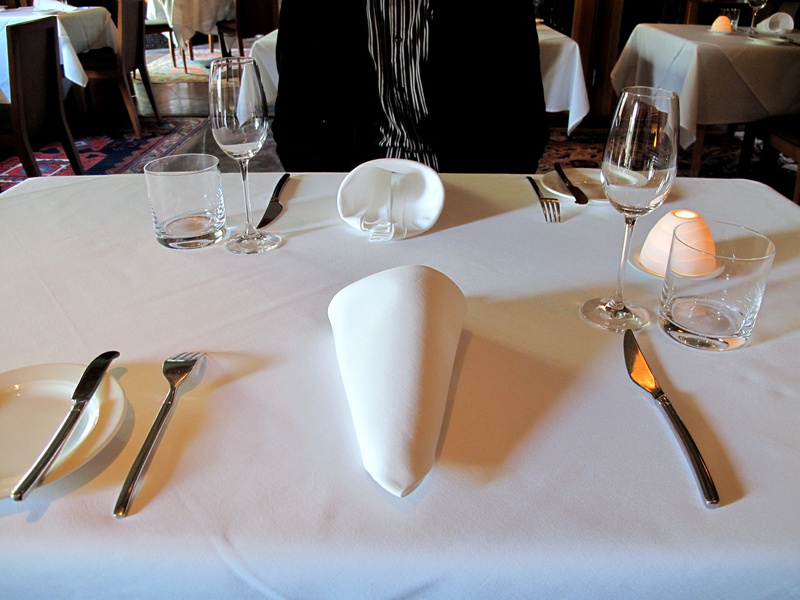 The meal began with a series of small dainties designed to whet the appetite. Kinch prescribes to same thinking that I do: amuses are a chance to have fun, experiment, to agitate and tease or, in his concise words, ‘throw you a curve ball’. There is no necessary pattern to what ensues, but that is precisely his point, ‘it’s to make you think, ‘what’s coming next?’ Thus, today we toured the Continent, from Italy (grissini) to Spain (gazpacho) to France (l’Arpège egg) with our taste buds enticed with things sweet, savoury, sour and spicy and our minds amused and confused. With the yuzu and…mackerel dish, dinner moved into another gear. The flavours here, crystal clear, big and bold, startled and thrilled. And this was only the first in a string of plates that provoked, pleased and impressed. 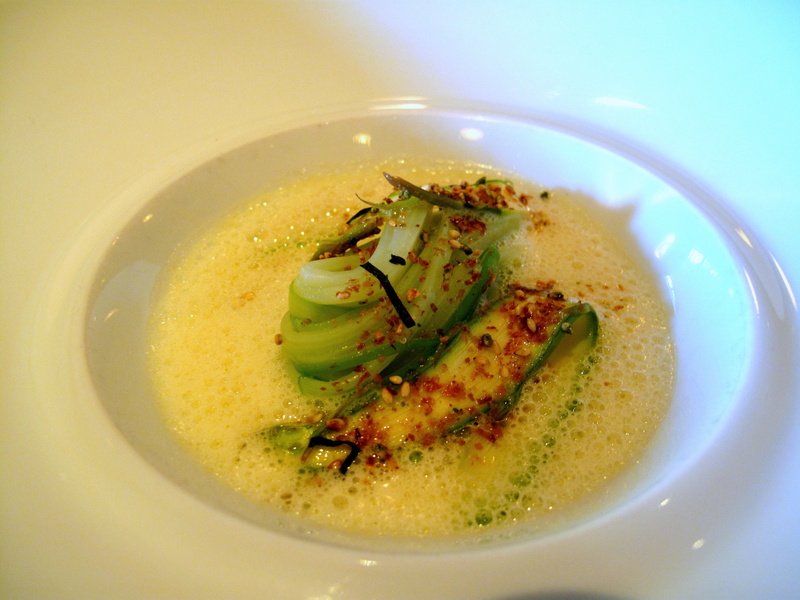 The asparagus in bonito butter possessed layers of fascinating savour and supplied a strong umami slap. The mar y muntanya was graceful, refined and full-flavoured whilst testing the intellect, inducing and seducing one’s imagination. Straight after that stimulating course came another maybe even more so – ‘into the vegetable garden…’ This dish is definitive of David Kinch’s cuisine and the most obvious manifestation of his farm-to-fork philosophy. The chef has one rule: if it arrived from the garden, then it had to be on the plate. Therefore, each ingredient is both symbolic of Love Apple Farm and a tribute to it; and thus, it is also always changing, always evolving – so although the raw materials may not be, the recipe certainly is alive. The allure of this dish is that it develops day to day, diner to diner. Initially inspired by Bras’ gargouillou (except for the dirt, which came courtesy of Redzepi), it was first a ‘reflection of the garden’, but has since grown into more, a ‘concept of a sense of place’; no longer a mirror, it is an edible translation of Manresa’s terroir. 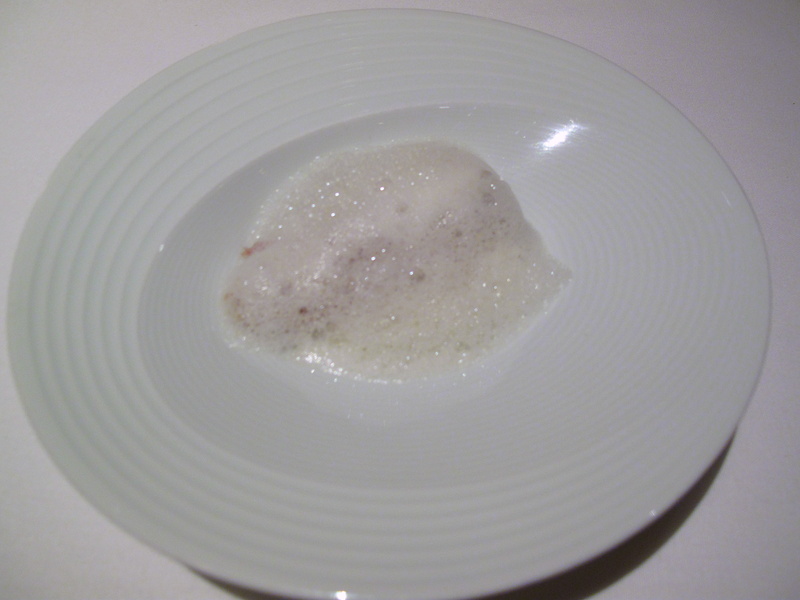 After these mental manipulations came arguably the tastiest course of all – Atlantic cod with fava beans. A mingling of Catalan and Basque staples, this fatty, unctuous and rare delicacy was simple and simply beautiful – bright green against bright white. It was also utterly indulgent. The cooking, precise and skilled, was informed by the chef’s comprehensive culinary experiences and preferences. It was a gastronomic journey that revealed where Kinch has been and what he has liked. Tonight, the ambience, scene and the service, all came together with the food, to deliver an excellent and exciting evening that was instantly and sincerely memorable. And there remains more to be said. 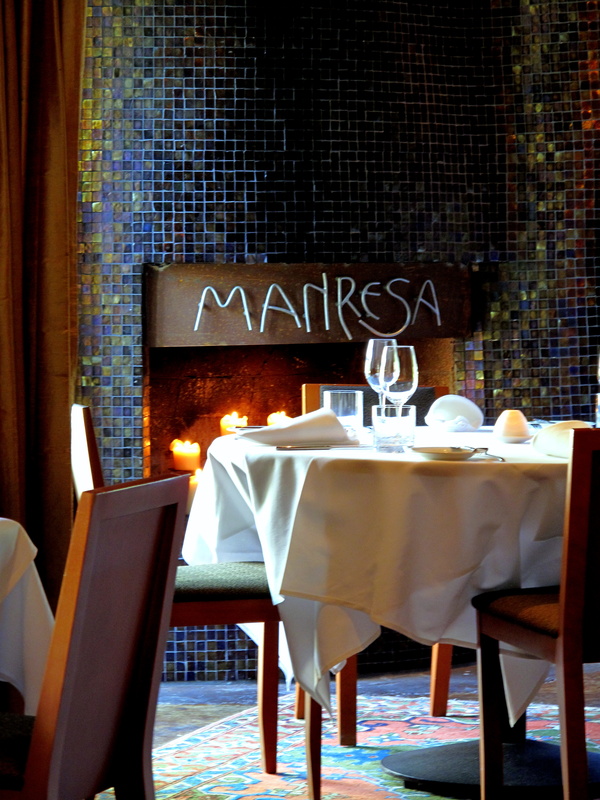 (1) You’re welcome (for raving about Manresa so much since the day you met me). (2) I’m glad to know her name is Nutmeg. 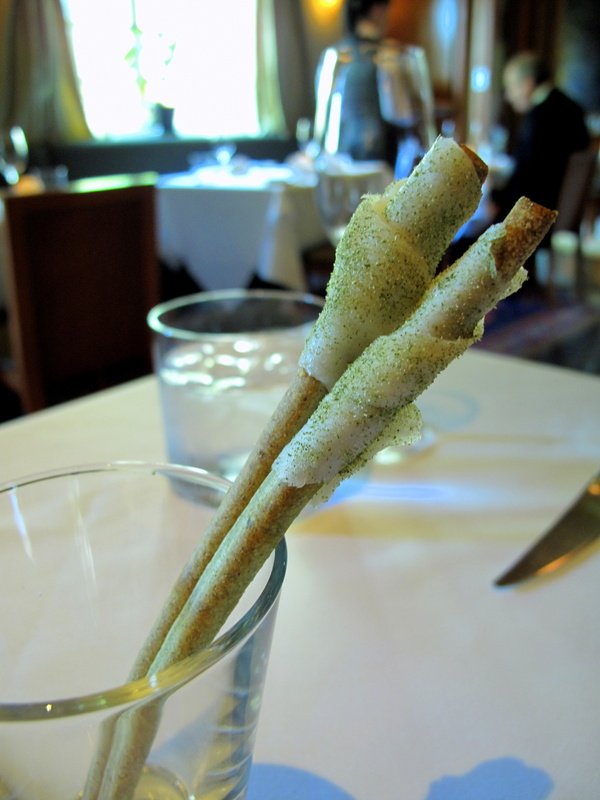 Nice to read a first timer’s opinion – never had anything resembling the asparagus/bonito butter – new one for me. It’s embarrassing that i’ve only been once this year. C: Truly envious at how you (and Aaron) have really been able to a. enjoy so many meals there; and b. watch the place grow and cooking develop. Good to see you back, FS. What a stunning meal. 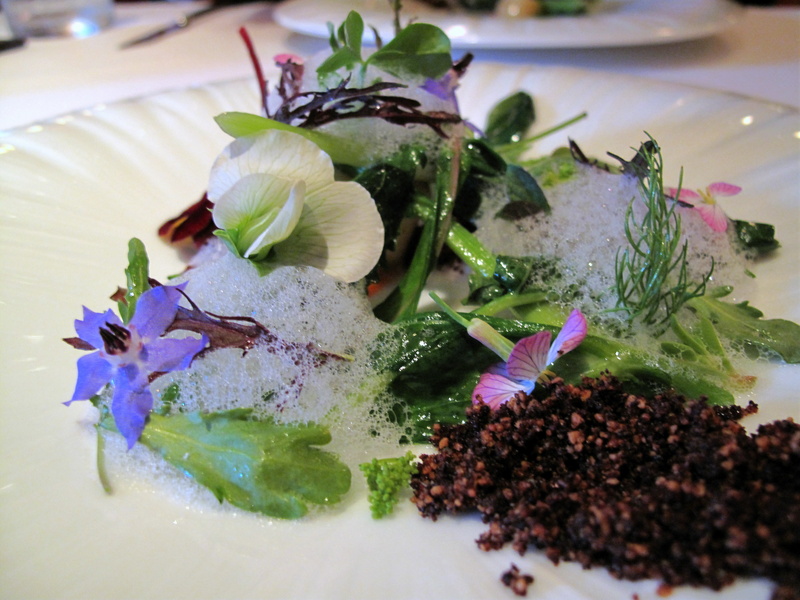 The dish with the radish flowers looks completely delightful. Thanks for the great report. I know that you put a lot of work into it. Can’t wait for my meal there next month !! O: Cheers, buddy. To be honest, during that middle segment of the meal especially, each dish was a body blow…he didn’t really give me much of a chance to catch my breath back before hitting me with another big dish. FB: Indeed. We were spoiled! Glad you enjoyed it, CarinaOst. These simply look beautiful. I am sure they taste delicious as well. I would to link here when I discuss about Saratoga Weddings if you are ok.